When I first began blogging about wine back in 1988, there wasn’t even an internet. The whole world was like North Korea, except with dogs. That didn’t stop me from writing a weekly blog about wine. (I’m actually the person who came up with the word “blog,” which was based on the noise my stomach made when I sat down to write. I also coined “tweet,” which had to do with flatulence, and, given the 45th President, has never been more appropriate.) Without the internet, my blog (I was then the “HoseApprentice of Wine”) wasn’t widely read. So nothing has changed. Recently, I had reason to revisit my earliest blogs. I had stored them in the Cloud, which is what I call my attic. I was amazed when I read my blog post from December of 1988 entitled, “The Future of Wine.” It’s eerily prescient, with a hint of mold. I was a fungi even then. In the past few weeks, I’ve read many blog posts about wine trends to watch in 2018. They were all stupid. 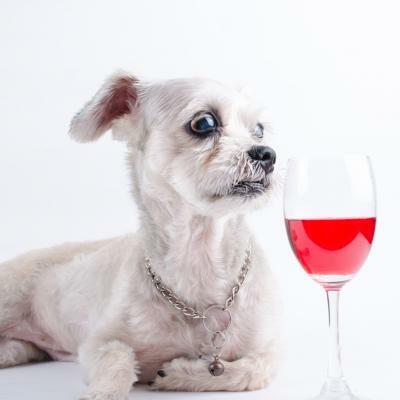 There’s more insight in a James Laube column on winery dog calendars. Hell, there’s more insight in a winery dog’s column about James Laube calendars, when every month is way past time to retire. At least I took some chances back in 1988 on my wine predictions, unlike the predictable pablum that’s around today. Here are some excerpts. “In 2018, the great wines of the world will be prohibitively expensive for the everyday wine lover. Margaux in a Tallboy will cost $1,000 or more. Much of the fun of wine snobbery will vanish for the average consumer. And let’s face it, without pretension, wine just doesn’t taste as good. Wine snobs will be forced to turn elsewhere. What will they be able to brag about drinking that they can afford to drink? It won’t be cult Napa Valley Cabernet. By 2018, Opus One will be $300/plastic bladder — pricey, but it looks cool hanging from your belt. Château d’Yquem will run $1,000. So, while it sports a very flashy sippy cup, those prices are all Ygrec to me. Next post: What do we mean by fine wine?